Doing the Right Thing: Are your measures correct? "A lot of good analysis is wasted doing the wrong thing." Anyone who has worked with data on business problems is probably aware of this adage. And this past week, I was reminded once again of this fact while analyzing a marketing program. This example is so striking, because difference between doing the "right" thing and the "almost-right" thing ended up being more than a factor of 10 -- a really big variance on a financial calculation. Some background. One of my clients does a lot of prospecting on the web. They have various campaigns to increase leads to their web site. These campaigns cost money. Is it worth it to invest in a particular program? This seems easy enough to answer, assuming the incoming leads are coded with their source (and they seem to be). Just look at the leads coming in. Compare them to the customers who sign up. And the rest, as they say, is just arithmetic. Let's say that a customer who signups up on the web has an estimated value of $300. And, we can all agree on this number because it is the Finance Number. No need to argue with that. The first estimate for the number of leads brought in was around 160, produced by the Business Intelligence Group. With an estimated value of $300, the pilot program was generating long term revenue of $48,000 -- much more than the cost of the program. No brainer here. The program worked! Expand the program! Promote the manager! The second estimate for the number of leads brought in was 12. With an estimated value of $300, the pilot was generating $3,600 in long term revenue -- way less than the cost of the program. Well, we might as well burn the cash and roast marshmellows over the flame. No promotion here. Know any good recruiters? Both these estimates used the same data sources. The difference was in the understanding of how the "visitor experience" is represented in the data. For instance, a visitor has come to the site 300 times in the past. The 301st visit was through the new marketing program. Then two weeks later on the 320th visit, magic happens and the visitor becomes a customer. Is the lead responsible for the acquisition? This problem is called channel attribution. If the customer had signed up when s/he clicked as a lead then yes, you could attribute all or most value to that marketing program. But two weeks and 20 visits later? Not likely. The lead was already interested. And then . . . the visitor keeps using the new browser (or whatever). And then later, s/he decides to login. At that point, the visitor is identified as a customer. And, more importantly, the VisitorId associated with the visitor is now a customer. But that doesn't mean that the lead created the customer. The logging in merely identified an existing customer. Guess what? This happened more times than you might imagine. In many, many cases, the 160 "customers" generated by the leads had been customers for months and years prior to this marketing campaign. It doesn't make sense to attribute their value to the campaign. The moral of this story: it is important to understand the data and more importantly, to understand what the data is telling you about the real world. Sometimes in our eagerness to get answers we might miss very important details. As a final note, we found the problem through a very simple request. Instead of just believing the number 160 in the report generated by the Business Intelligence Group, we insisted on the list of leads and account numbers created by the program. With the list in-hand, the problems were fairly obvious. SQL is a very powerful language, which could, of course, be made even more powerful and useful. This post discusses three features of the language -- ANSI standard features -- that seem not only unnecessary but downright detrimental. That is, they seem to cause much more confusion than they provide in functionality. And, in all these cases, it would be easy to work around their absence. Although it would be nice to remove these from the language itself, that is unlikely to happen. However, they can be de-prioritized for people learning SQL. These constructs are easy to work around and are less functional than their alternatives. When learning SQL, these should be learned later in the process. In some databases, you might have to add a from dual or from sys.dummy to make this work. Trying to fit this into a VALUES statement just causes syntax errors and confusion. And, you can use UNION ALL to add multiple rows at the same time. The VALUES statement has exactly one advantage and that is the fact that it is standard. The same code will work in multiple databases. That seems very minor. It would be better if the standard had a way of using SELECT to return a row without a table. What makes the GROUP BY better? Primarily the fact that you can have a HAVING clause. So, SELECT DISTINCT is sometimes understood to be: "Get me all the rows that are distinct". Rather than, "Get me the distinct values from all the rows." Actually, that first interpretation makes a lot of sense, even if it is wrong. Not only is there no danger of confusion with the GROUP BY, but including HAVING COUNT(*) = 1 actually solves the first problem. No way to do that with SELECT DISTINCT. The second problem is perhaps more dangerous. Have you ever seen someone write this? 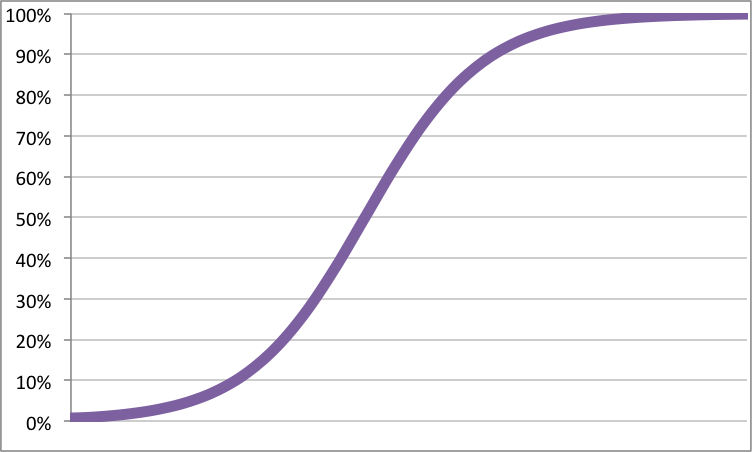 Here, the DISTINCT seems to be used like a function. The intention is "Get me distinct values of a along with arbitrary values of b and c". Of course, this is exactly the same with or without the parentheses. DISTINCT is not a function. This usage is so prevalent that Postgres introduced the DISTINCT ON syntax to support it. What advantages does SELECT DISTINCT have? The syntax is shorter and you don't have to repeat the column names in a GROUP BY clause. In a world of cut-and-paste, copying the column to GROUP BY is negligible effort. And, it does allow SELECT DISTINCT *. However that is a construct that I wouldn't miss at all. Finally, there is the COUNT aggregation function with a column as an argument. Just to be clear, I have no problem with COUNT(DISTINCT column) or COUNT(*) or COUNT(1). No doubt, the designed of SQL were obsessed with NULL values (and despite the obsession, they still didn't get it right). Wouldn't everyone in the world (who uses SQL) want to count the number of non-NULL values in a column? What else could COUNT(column) mean? Such confusion would be a non-issue. What is a list of three things without a fourth to cap it off? Just don't use a comma in the FROM clause. Explicit join syntax is more expressive and clearer in every case. The , can be replaced by CROSS JOIN. For instance, Siegel reports, people who buy small felt pads that adhere to the bottom of chair legs (to protect the floor) are more likely than others to be good credit risks. For some people, results like this conjure up magic. PhDs in white coats bustling around, surrounded by acres of machines humming away pondering this imponderable problem (or is that the air conditioning making the noise). In fact, something like this is readily calculated from a normal decision support database containing historical data. So, how hard is it to write the SQL? For all products purchased by customers in 2013, what is the non-payment rate for the first three months of 2014? Note that this is carefully phrased as a "before" and "after" problem. Although that does not guarantee causality, it does help. This isn't a particularly complex SQL. Instead, we can think about what is really important. The first is being willing to ask the question. I think a major constraint in business is that managers and executives are hesitant to ask questions. They don't have a sense of what is "easy" to answer and what is "hard". They also fear getting different answers from different people. The second is the interpretation. The statement that people who want to protect their furniture are better credit risks has a nice warm and fuzzy quality: people who care about their belongings also care about their credit. Perhaps other factors are at work. People buy new furniture and want to protect it because they have access to cash or credit -- they may simply be richer than other people at least for a period of time. Or, felt pads may only be sold in areas where people tend to own their homes, so there is a store-bias in the merchandizing. Or, customers who buy these small items may be paying in cash and never make larger purchases that might measure credit risk. To understand what is really happening would require further analysis. To get started just takes asking some insightful questions. Last week, a book -- a real, hard-cover paper-paged book -- arrived in the mail with the title: Heuristics in Analytics: A Practical Perspective of What Influences Our Analytic World. The book wasn't a total surprise, because I had read some of the drafts a few months ago. One of the authors, Fiona McNeill is an old friend and the other Carlos is a newer friend. What impressed me about the book is its focus on the heuristic (understanding) side of analytics rather than the algorithmic or mathematical side of the subject. Many books that attempt to avoid technical detail end up resembling political sound-bites: any substance is as lost as the figures in a Jackson Pollock painting. You can peel away the layers, and still nothing shows up except eventually for a blank canvas. How long until someone will pay a delinquent bill? How much money can likely be recovered? This particular example goes through multiple steps around the business process, including financial calculations on how much the modeling is actually worth. It also goes through multiple types of models, such as a segmentation model (based on Kohonen networks) and the differences -- from the business perspective -- of the different segments. Baked into the discussion is how to use such models and how to interpret the results. In such a fashion, the book covers most of the common data mining techniques, along with special chapters devoted to graph analysis. This is particularly timely, because graphs are a very good way to express relationships in the real world. I do wish that the data used for some of the examples in the book were available. They would make some very interesting examples. Euclidean geometry, formalized in Euclid's Elements about 2,300 years ago, is in many ways a study of lines and circles. One might think that after more than two millennia, we have moved beyond such basic shapes particularly in a realm such as data mining. I don't think that is so true. 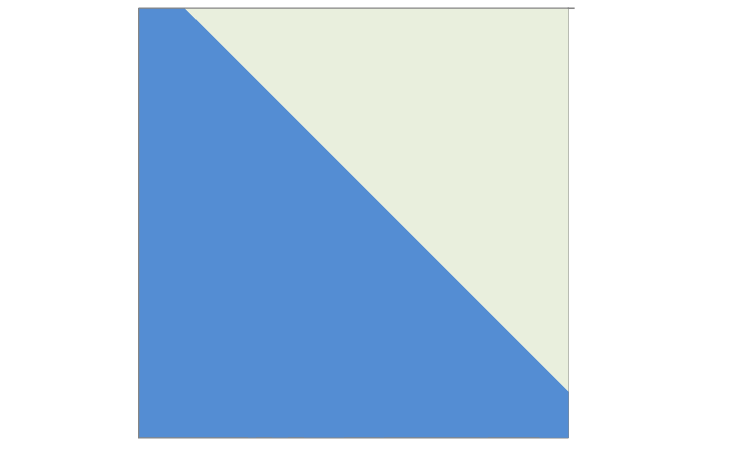 In this case, the light grey would be "0" (that is, less than 50%) and the blue "1" (that is, greater than 50%). 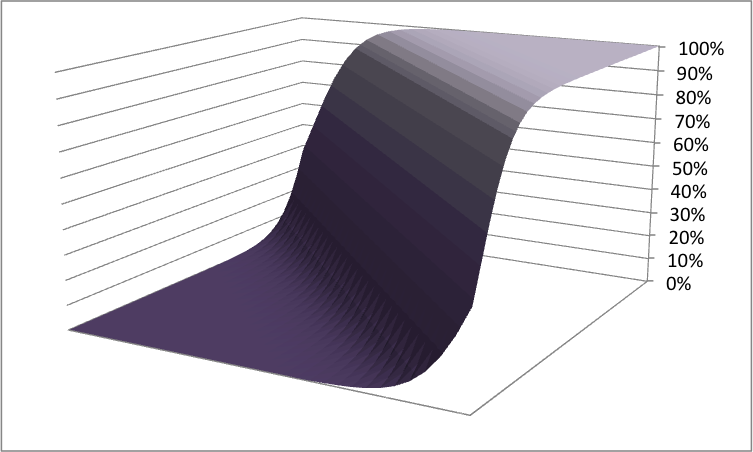 The boundary is where the logistic function takes on the value 50%. Note that this is true even when you build a logistic regression sparse data. For instance, if your original data has about 5% 1s and 95% 0s, the average value of the resulting model on the input data will be about 5%. However, somewhere in the input space, the logistic regression will take on the value of 50%, even if there is no data there. Even if the interpretation of a point in that area of the data space is non-sensical (the customer spends a million dollars a year and hasn't made a purchase in 270 years, or whatever). The line does exist, separating the 0s from the 1s, even when all the data is on one side of that line. What difference does this make? Logistic regression models are often very powerful. More advanced techniques, such as decision trees, neural networks, and support-vector machines, offer incremental improvement, and often not very much. And often, that improvement can be baked back into a logistic regression model by a adding one or more derived variables. What is happening is that the input variables (dimensions) for the logistic regression are chosen very carefully. In a real situation (as opposed to the models one might build in a class), much thought and care has gone into the choice of variables and how they are combined to form derived variables. As a result, the data has been stretched and folded in such a way that different classification values tend to be on different "side"s of the input space. This manipulation of the inputs helps not only logistic regression but almost any technique. Although the names are fancier and the computing power way more advanced, very powerful techniques rely on geometries studied 2,300 years ago in the ancient world.